Everybody has problems and Pamela May is no exception! But Grandma knows a thing or two about solving problems as well as teaching kids. 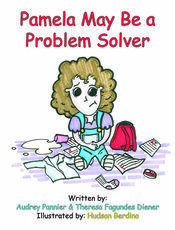 Join Pam, Grandma and Mom as they work through a dynamic system for solving problems that utilizes feelings, thinking, drawing, talking, planning, solving and evaluating in a series of steps along the pathway from problem to solution. Based on a review of research and problem solving literature, this system is designed to provide a step by step procedure to help children become independent and confident problem solvers.